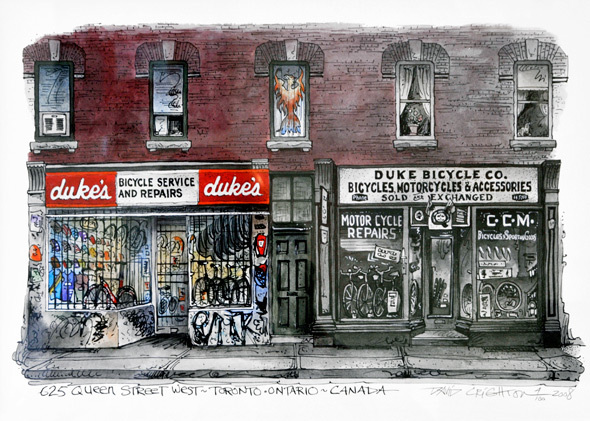 Duke's Cycle is back at 625 Queen Street West â where it belongs. After a six-alarm fire destroyed it and nearby buildings in 2008, it's been a long and expensive return journey, but one that the Duke family was firmly committed to when they decided to keep their nearly century old business alive in the wake of the blaze. And although it's the only one of the buildings lost to the fire that has been rebuilt, the homecoming is surely a positive sign that the renewal process is well underway. When it was first announced that Duke's would return to its original location, urban enthusiasts and architecture buffs expressed some concern over the exterior design of the new building. Gone was the red brick typical of Queen West, to be replaced by a somewhat bland facade with little historical connection to the area. Strangely, although the actual structure sticks very closely to the renderings, these concerns and criticisms seem less founded now that it's complete. The building might not be a masterpiece, but it certainly looks like it belongs on the street. And besides, one can only imagine how much worse it could've been. 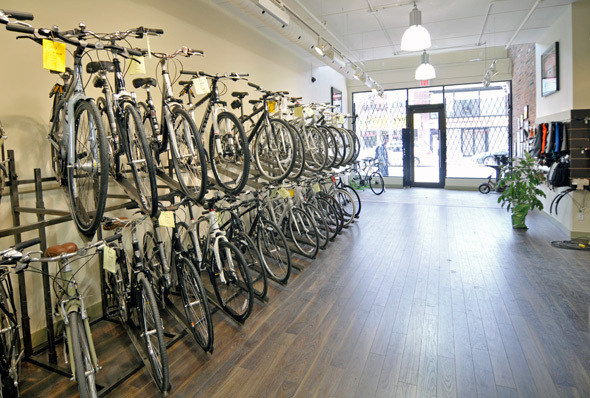 The inside of the store is, as far as bike stores go, pretty much fantastic. Post-fire, the retail space has expanded onto the second floor, and now makes up a total of 5000 square feet. An airy space, the new layout has allowed Duke's to add a few features that wouldn't have been possible before. Already in place is a women's section at the southeast corner of the second floor, beside which will eventually be a full-service fit studio. 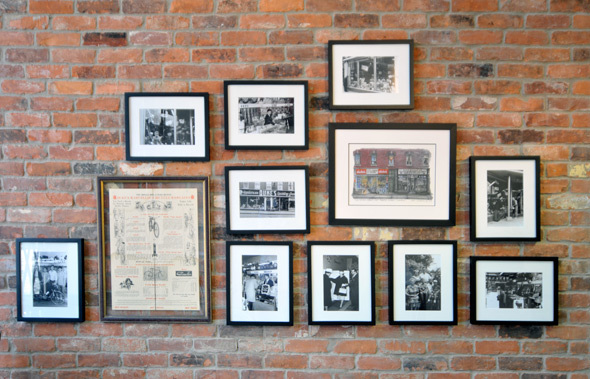 On top of these more functional features, the showroom is dotted with black and white photos of the old store and framed jerseys, both of which give the sense that this is place that takes cycling very seriously. 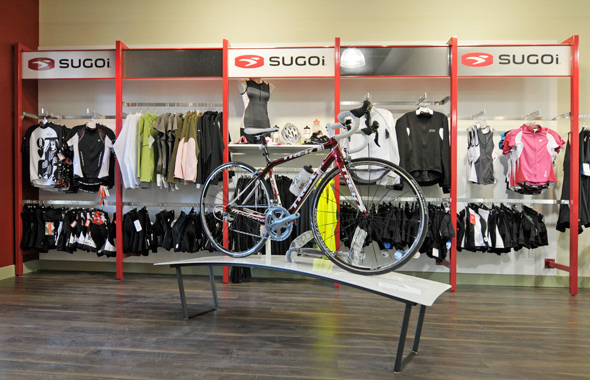 The two-floor arrangement also helps to divide the the types of bikes and merchandise on offer. 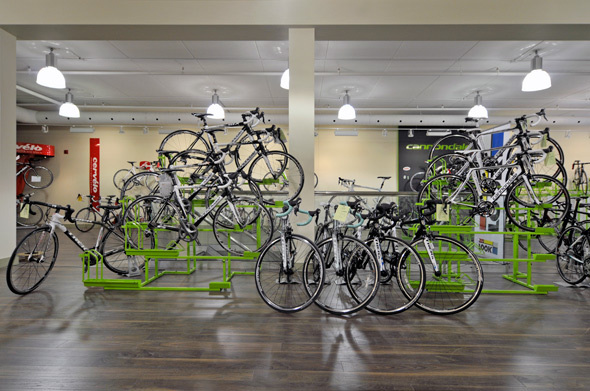 Generally speaking, the first floor is reserved for commuter-oriented bikes and accessories, while the showroom on the second floor features higher end road, mountain and tri (time trial) bikes, along with all the spandex you could ever care to outfit yourself in. 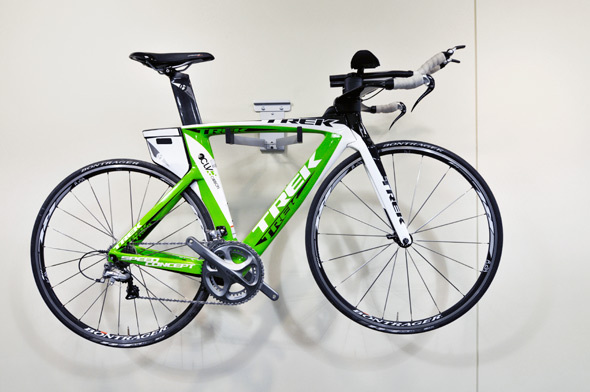 Brand wise, the store continues to feature a wide variety of big-name manufacturers, including Trek, Cervelo, Kona, and Cannondale. Typical of full-service shops, the price range is enormous â starting at around $500 and going up to $10,000+. With so many different kinds of bikes on offer it's tough to give a so-called sweet spot. Suffice it to say, that if you're willing to spend over the minimum, there'll be a good selection in whatever price range you choose. Same goes for accessories and attire. You want; they got. When a shop has this amount of space, there's really no option other than to fill it up. 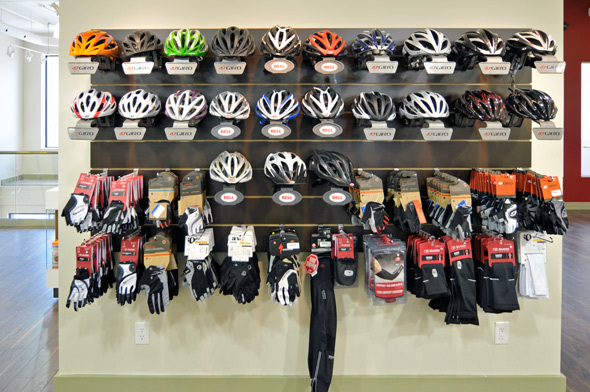 And while the bikes are still arriving from the temporary Richmond location and from suppliers, my walk-through yesterday revealed that when it comes to tires, tubes, gloves, fenders, locks and the like, the store is stocked up and ready to go. When chatting about the new location and whether or not the store's identity has changed during the rebuilding process, Duke's manager Michael Cranwell is quick to point out that the plan to move back to Queen had everything to do with the desire to maintain the reputation the shop has built over the last 97 years or so. As much as this is a place to buy a dream bike, they want customers to feel like they can bring in a beater with a flat tire as well. The cycling scene "has many communities," Cranwell explains. "But the bottom line is we're all cyclists. We think the store has always represented that." Indeed. Welcome back to Queen, Duke's.